It looks like this week will be transportation cycling only. That’s okay, that’s why I live in town now. I woke up feeling horrible on Monday and almost drove to work. I hopped on the single-speed and pedaled my way in anyway. It made me feel better. I adjusted the brakes on the recumbent, so I rode it into work today. I had to stop for dog food on the way home. 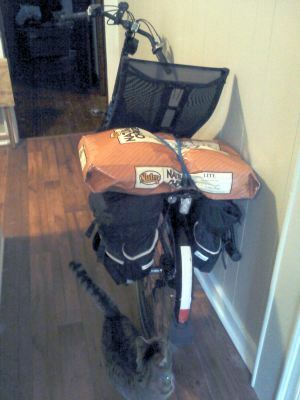 I was leery of trying to haul a 40 lb bag, so I grabbed a smaller one. It worked fine. I’ll get the 40lb next time. I thought about the fact that my commute and errands over the last two days haven’t been many miles. Then I realized that although 15.5 miles over two days may not be much, it’s a lot more exercise than I used to get. I also didn’t burn any gas to get to work or get dog food. Yes, I am happier this way. Oh, and yes, that is the cat checking out the dog food back. Weird cat. Yes, mega-mileage is very satisfying, but parking the car for the week if moreso, IMHO. I’m back on the horse tomorrow and excited about it. For some reason, I have a hard time motivating myself to get those utility miles in, beyond commuting. I do commute every day. I guess the biggest factor for errands is that I like run them with my wife, and she doesn’t ride. Tim, Good! Enjoy your commute! My wife doesn’t ride either, but she’s gone for weeks or months at at time, so that leaves me plenty of time to run errands without her. Even when she is home, I’ll sometimes stop on the way home from work to buy something. I’m glad you’re still out there pedaling!